Season the chicken with salt and pepper then place in an oven-proof dish and cover with foil. Add the herbs and garlic then place in the oven and allow to roast for 20-30 minutes until the chicken is almost cooked through and the garlic is soft. Remove the foil and turn the heat up to 220°c. Allow to roast for another 10 minutes until the chicken is golden brown then remove and allow to rest for 5 minutes. In the meanwhile, steam the cauliflower until soft then purée with the butter, salt and pepper. 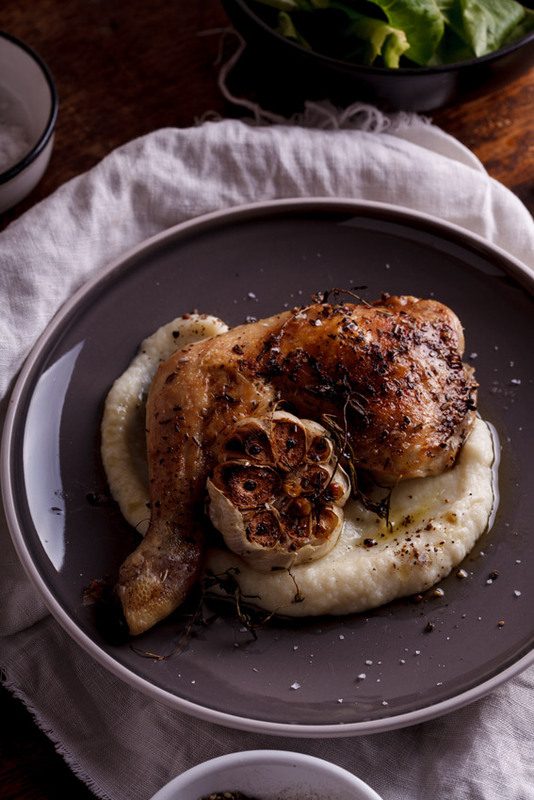 Serve the roast chicken with the cauliflower purée, roasted garlic and vegetables of your choice.